Curious Louis: Why malls struggle, especially those in north St. Louis County? The food court at St. Louis Outlet Mall is now nearly empty of restaurants. The Jamestown Mall Dillards in December 2016. Many of the larger anchor stores at St. Louis Outlet Mall no longer are accessible from the interior of the mall. North county resident Erica Holliam said Books-A-Million closed a few months ago; the last store she used to frequent at the St. Louis Outlet Mall. Erica Holliam used to love shopping at the St. Louis Outlet Mall, or what used to be called the Mills Mall. That was before all of her favorite stores closed. The weekend before Christmas she described the mall as a “ghost town.” A few shoppers walked along the carpeted interior hall, but many of the bigger anchor stores were blocked off and only accessible from the mall’s exterior. What’s especially painful to Holliam is that this isn’t the first time she’s watched a mall’s slow slide. What Holliam doesn’t understand is why it keeps happening to malls in her area. It’s a question she posed to Curious Louis, so we set out to answer it. First, we took a look at overall retail trends, which haven’t been kind to the traditional enclosed mall. One analyst suggested that a third of the country’s 1,200 malls will close in the next few years. A big reason is on-line shopping. “A lot of commerce is shifting to on-line retailing, as opposed to bricks and mortar,” agreed Jim Fisher, a marketing professor at Saint Louis University. 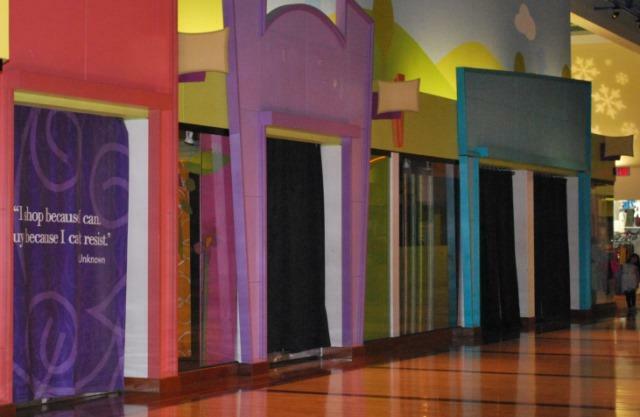 Many of the stores inside the St. Louis Outlet Mall are closed and are now covered by colorful curtains. He said department stores, which often serve as anchors for malls, also are struggling. Meanwhile other retail concepts are gaining popularity, such as shopping and entertainment districts. Lastly, Fisher said the business model of malls just doesn’t work well today. “Malls had their day in the sun at a time when land and energy prices were lower and now you’ve got a different environment,” he said. Those big public interior areas don’t provide much revenue but still must be heated and cleaned. Malls today almost have to be built along heavily-traveled interstates to be successful, according to Bob Lewis. The principal at St. Louis-based Development Strategies, an economic development and real estate consulting firm, said decades ago malls were built along arterial roads. St. Louis Outlet Mall, while it’s on Interstate-370, still is out-of-the-way, according to Lewis. And the now closed Jamestown Mall, north of Florissant, was nearly in the country. Lewis said when Jamestown was built in 1973 developers expected a lot more homes would be built nearby, an estimated 8,000. That construction never happened after geologists discovered a karst topography, or sinkholes, in the area north of the mall. But the biggest reason for Jamestown’s failure, according to Lewis, is what he calls a not very pretty part of the story: white flight. “Jamestown was the perfect storm of forces that changed,” Lewis said. As whites moved out of north county, more African-Americans moved in and the average income level didn’t rise to what developers had anticipated. Lewis said it comes down to income level density, and north county doesn’t have the numbers or average salary to support a traditional enclosed mall. Early last year the St. Louis Outlet Mall was bought by the Namdar Realty Group for $4 million. That’s a far cry from the $240 million it cost to build the malls back in 2003. Namdar did not respond to call for comment from St. Louis Public Radio. A few miles away, Jamestown Mall sits empty. But St. Louis County is stepping in to redevelop the property. The St. Louis Economic Development Partnership is working to buy out all five of the mall’s out-of-state owners. County Executive Steve Stenger said it’s a top priority for his administration. “I want to see the property returned to a productive use for north county and all the county,” he told St. Louis Public Radio. It’s too early to say what might go in the mall’s place, Stenger said, but the county plans to get feedback from residents about what they want. As for Erica Holliam, she said it may be naïve, but she still thinks a good mall would work in north county.